Publicity surrounding herbal tea benefits and the vast array of delectable flavors available to consumers have caused herbal tea to surge in popularity. When you enjoy a healthy cup or several mugs of herbal tea each day, you are actually consuming an herbal infusion – also known as a tisane – rather than actual brewed "tea." Herbal infusions look like tea and are brewed in boiling water like tea – yet they do not come from the Camellia sinensis bush, the plant from which all teas are made. Instead, tisanes are made from carefully planned and measured mixtures of botanicals. An herbal infusion may contain select dried leaves, pieces of ripe fruit, flowers, grasses, nuts, barks, seeds or other botanicals that give them their taste and contribute to an array of folk and researched-based herbal tea benefits. Here are some of the suggested herbal tea benefits when consumed on a daily basis. Following are some of the herbs and botanicals found in tisanes. Chamomile（洋甘菊） is known for its calming attributes said to have a host of anti-inflammatory and anti-spasmodic properties that help relieve and ward off a variety of maladies. Chrysantemum（菊花） provides a sweet tasting brew and is supposed to help reduce body heat resulting from fever. It also is known to help protect against liver damage and neutralize toxins in the body. Cinnamon（肉桂） has a calming effect and is thought to support healthy circulation and digestion. Fennel（小茴香） has been used for centuries as a digestive aid and to soothe upper respiratory problems. Ginger（生姜）is a centuries old herbal remedy used to treat a wide range of health concerns from nausea and colds to indigestion and migraine headaches. 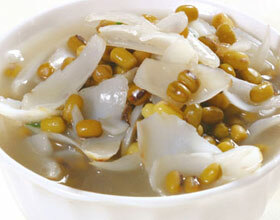 Ginseng（人参） is believed to stimulate vitality and help the body stay healthy. Hibiscus（木槿花） has shown to help reduce high blood pressure and soothe menstrual cramps. Lemongrass（柠檬草） is used frequently in teas for its calming properties. Parsley（欧芹） has a diuretic effect and is purported to help with kidney function. Peppermint（薄荷） is thought to have greater stress-relieving attributes than chamomile tea and help with stomach and digestive issues. It also helps freshen breath. Raspberry Leaf（覆盆子叶）helps with colds, sore throats, canker sores and diarrhea. In addition, drinking raspberry leaf tea may also keep nails, bones, teeth and skin healthy. Sarsaparilla（菝葜） is said to promote energy and healthy skin. Slippery Elm（榆树） has properties that help relieve stomach cramps and other gastrointestinal problems. There are a plethora of herbal tea choices available from tea houses and retailers. In addition to herbal tea benefits, you will find that tisanes are a taste treat and pleasure to drink. Of course, in addition to herbal teas, there are a variety of different herbal and fruit beverages that offer excellent health benefits. If you are interested in starting a tea or herbal beverage regime for medicinal purposes, first familiarize yourself with the composition of your herbs and note other prescription drugs and supplements you are taking. While most herbal remedies are safe, always check with your doctor to ensure that what you are consuming complements your medication and are appropriate for your health. 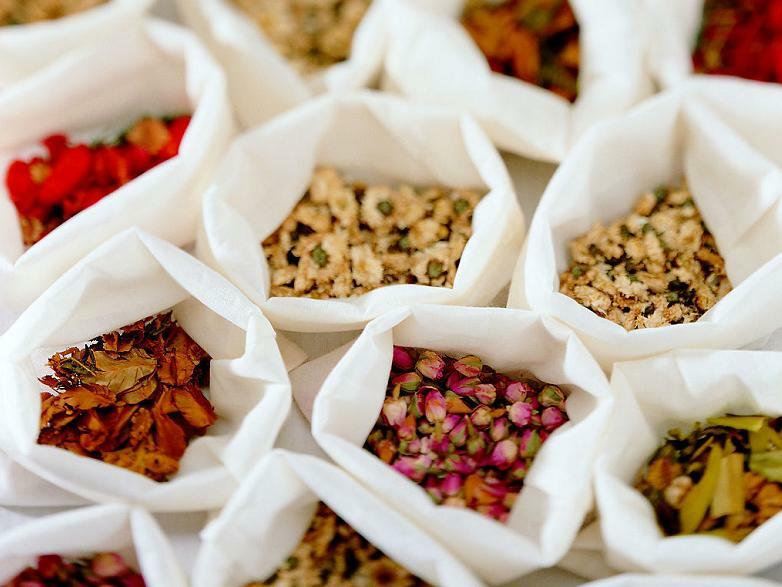 Herbal teas can be made with fresh or dried flowers, leaves, seeds or roots, generally by pouring boiling water over the plant parts and letting them steep for a few minutes. Seeds and roots can also be boiled on a stove. The tisane is then strained, sweetened if so desired, and served. Many companies produce herbal tea bags for such infusions. Flavored teas are prepared by adding other plants to an actual tea (black, oolong, green, yellow, or white tea); for example, the popular Earl Grey tea is black tea with bergamot (the orange oil, not the herb of the same name), jasmine tea is Chinese tea with jasmine flowers, and genmaicha is a Japanese green tea with toasted rice. • Comfrey（紫草）, which contains alkaloids that can cause permanent liver damage with chronic use. • Lobelia（半边莲）, which contains toxins similar in effect to nicotine.